Green Acres is a significant site-specific sculpture by Greek-American environmental artist Athena Tacha located in New Jersey’s Department of Environmental Protection (DEP) building’s 1980s era courtyard. Much of the sculpture, named in honor of the State’s land protection program, is an integral part of the ground plane. From overhead, one sees Green Acres’ biomorphic shape reflecting Tacha’s fascination with natural forms. This August, the State of New Jersey intends to demolish the work. Green Acres is one of more than 40 U.S. commissions produced in the past 35 years by artist Athena Tacha at locations ranging from New York to Alaska, including an entire city-block park in downtown Philadelphia. Tacha is one of the initiators of "site-specific" architectural sculpture -- a significant shift in attitude that brought "land art" into a social context. The Green Acres project, a 77 x 85 foot work, created in 1985, was the result of a competition held by the New Jersey State Council for the Arts’ % for Art program. The sculpture, which sits at the center of a red-quarry tile courtyard, was created in honor of the State’s land protection program, also called Green Acres, and contains 46 slabs of green granite onto which photographs of state landscapes, plants and animals (many of them endangered species) have been sandblasted. 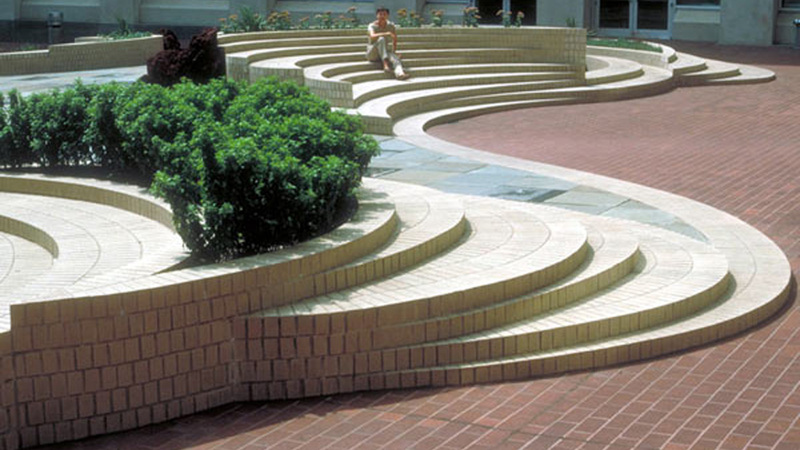 Crescent shaped planters with stepped seating ring the edges and the whole design recalls Roberto Burle Marx’s biomorphic modernism. The sculpture is surrounded on three sides by a seven-story buff-colored concrete building. Visitors to the courtyard have multiple points of access and egress, and frequent opportunities to view the sandblasted images (based on photographs by Lee Rue III and DEP staff). The sculpture is intended as a living addition to the courtyard: planters contain low-blossoming ground covers and yuccas whose colors change with the seasons. Green Acres is Tacha’s most complex commission and took two years to execute (at the not insignificant cost of $400,000); it has been praised by museum directors and art historians and is documented in the Contemporary Landscape Design Collection of Dumbarton Oaks in Washington, DC. An April 18, 2012 New Jersey Treasury Department letter informed Tacha that Green Acres would be destroyed on or after July 31, 2012 (received May 9, 2012) – the only alternative offered was removal of the sculpture at the artist’s expense. Green Acres has suffered from years of deferred maintenance and the Treasury Department asserts maintenance funding is not available in the current economic climate, despite the State legislature’s $1 million appropriation for restoring DEP’s courtyard (Green Acres was effectively restored in 2004-05 at a cost of about $30,000). The letter also stated that the piece poses a public safety risk during an emergency by impeding the evacuation of the building, an issue never before raised in the plaza’s 25-year history. Removal of Green Acres is not a viable option – it is financially onerous and, more significantly, would result in the loss of the work’s context, an integral and defining part of this site-specific sculpture. The public is encouraged to voice their support for the preservation of Green Acres by signing the change.org petition or writing to Guy C. Bocage, Deputy Director of the N.J. Department of Treasury, P.O. Box 034, Trenton, NJ 08625-0229. The public can also help get the word out by contacting local newspapers and media outlets and alerting them to the imminent destruction of this important work of public art commissioned by the State and symbolic of its environmental heritage.